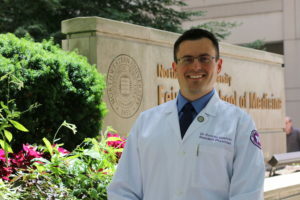 Konrad Sawicki, ’17 MD, ’17 PhD, a resident in internal medicine at Northwestern Memorial Hospital and a recent graduate of Feinberg’s Medical Scientist Training Program, was a first author of the study published in the Journal of Clinical Investigation Insight. 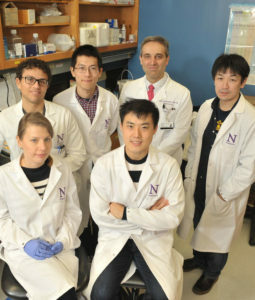 Northwestern Medicine scientists have shown for the first time how an RNA-binding protein in the liver plays an important role in regulating insulin sensitivity throughout the body. The findings, published in the Journal of Clinical Investigation Insight, could lead to the development of new therapies against diabetes targeted at the RNA level. Sawicki, a recent graduate of Feinberg’s Medical Scientist Training Program (MSTP), completed his doctoral degree in the laboratory of corresponding author Hossein Ardehali, MD, PhD, professor of Medicine in the Division of Cardiology and of Pharmacology, and director of the MSTP. Hsiang-Chun (Jimmy) Chang and Jason Shapiro, both current MSTP students, were also co-first authors of the paper. The investigators studied tristetraprolin (TTP), a protein that binds at the end of an RNA transcript to reduce RNA stability, ultimately leading to a reduction in gene expression. The protein has previously been shown to play a role in cancer and inflammation, and Ardehali’s lab has shown TTP’s involvement in cellular iron conservation, as well. The current study demonstrated that TTP also plays a role in regulating metabolism in the context of diabetes. In the study, the scientists found that TTP promoted the RNA transcript degradation of fibroblast growth factor 21 (FGF21), a hormone secreted by the liver that promotes insulin sensitivity in peripheral tissues. Mice who were genetically engineered to lack the TTP gene in the liver showed increased production of FGF21 and a significant improvement in diabetic parameters — such as glucose tolerance and insulin sensitivity in peripheral tissues — when fed a high-fat diet. The findings provide a new perspective into the pathogenesis of diabetes. “This is unique because most key metabolism pathways are regulated either at gene-transcription or protein-activity levels. Our pathway demonstrates that regulating the mRNA levels of a gene (after mRNA is produced) is also an important regulatory mechanism for systemic metabolism,” explained Chang, who is currently a postdoctoral fellow in Ardehali’s lab and will return to his third year of medical school in the fall. The findings may also inform new therapies in the future. In the past, studies that have investigated administrating high doses of FGF21 as a treatment in diabetes have yielded disappointing results, Ardehali said. Therapeutically targeting TTP instead might be a more effective method. “Our data indicate that increasing FGF21 by decreasing TTP levels may have therapeutic implications in metabolic disorders such as diabetes,” said Ardehali, also director of the Center for Molecular Cardiology at the Feinberg Cardiovascular and Renal Research Institute. Other Northwestern co-authors on the paper include Jason Wertheim, MD, PhD, vice chair for research and Edward G. Elcock Professor of Surgical Research in the Department of Surgery, and the MSTP’s new associate director for admissions; Marina Bayeva, ’15 MD, ’12 PhD, an alumna of MSTP and former postdoctoral fellow in the Ardehali lab, as well as a current resident in psychiatry at Northwestern Memorial Hospital; and Adam De Jesus, a current MD/PhD student. After residency, Sawicki intends to pursue a fellowship in cardiology and continue his research in cellular and mitochondrial metabolism. Learn more about resident research at Northwestern at the Housestaff Research Portal.